At Ace Mole Control we aim to give our customers in Ravenshead and surrounding towns an unrivalled mole catching service. All our clients in Ravenshead have come to expect excellent customer service at a competitive price. In Ravenshead we provide a mole removal service from the smallest domestic gardens to catching moles on farmland. Ace Mole Control guarantee results for our mole catching services in Ravenshead. With several years experience catching moles in Ravenshead we are so confident that if we don’t catch you don’t pay. Ace Mole Control use traditional trapping methods to deal with moles in Ravenshead because this is the most effective way to remove a mole problem. We operate out of Ravenshead for both the domestic and commercial customer and can offer contract work for our larger customers. Ace Mole Control in Ravenshead is fully insured and catches moles for schools, cemeteries, golf courses, sports fields, council and the local authority. For an emergency mole catcher in Ravenshead call Ace Mole Control immediately. Or if you just need friendly advice from a skilled mole catcher just give us a call. Ace Mole Control is a member of the British Traditional Molecatchers Register and the Guild of British Molecatchers. We now offer pest control services. To prevent even more damage, act early and contact a professional at Ace Mole Control now. 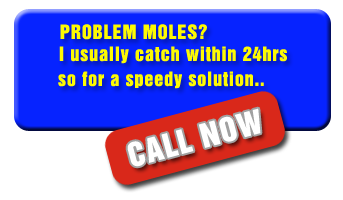 For a free, no obligation quote or for friendly advice on your mole problem.